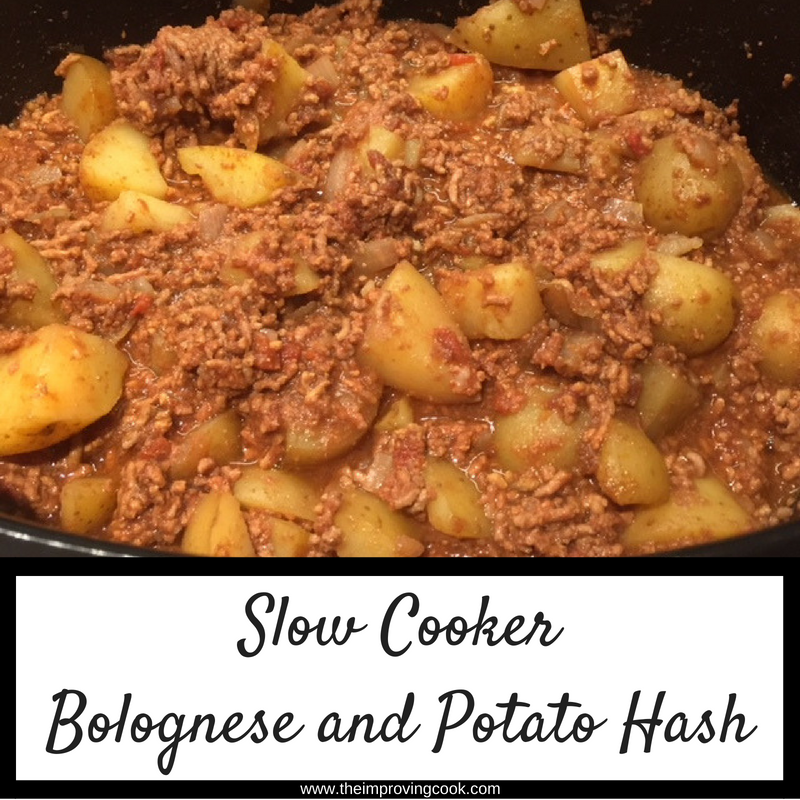 I spent quite a while coming up with a name for the recipe I'm sharing today- Slow Cooker Bolognese and Potato Hash. In the end my friend came up with the name, when she was visiting last weekend. 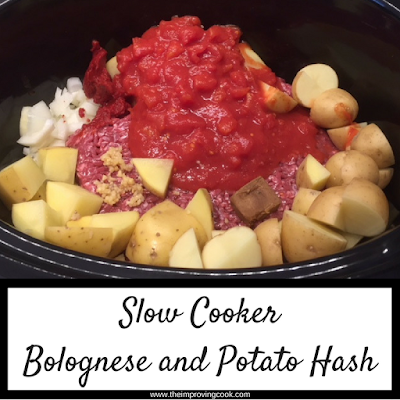 What do you call something that's essentially a traditional beef bolognese made in the slow cooker with potato? We toyed with Bake, but it's not baked. She suggested hash, which resulted in some pondering about what hash means in the foodie sense. Corned Beef Hash has potato in, and is sort of thrown together, so that must work, right? Let's hope so, because that's what I've gone for! I decided to do a spin on spaghetti bolognese, because it has so much flavour. All that rich sauce- it must surely be a good idea to put potato in it? 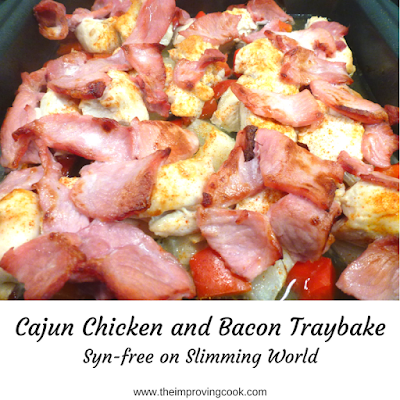 Excellent comfort food! Beef Bolognese works beautifully in the slow cooker. 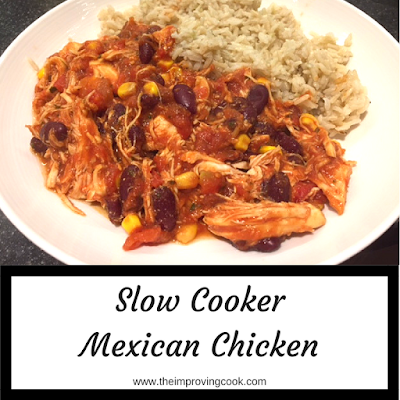 It allows the sauce to really develop a deep, rich flavour. What you do need to be careful of however, is how much liquid you add. It's tempting to put in as much stock as you would in a saucepan, but you must resist! The mince will end up stewing in the stock if you do, plus liquid doesn't evaporate quickly in a slow cooker. 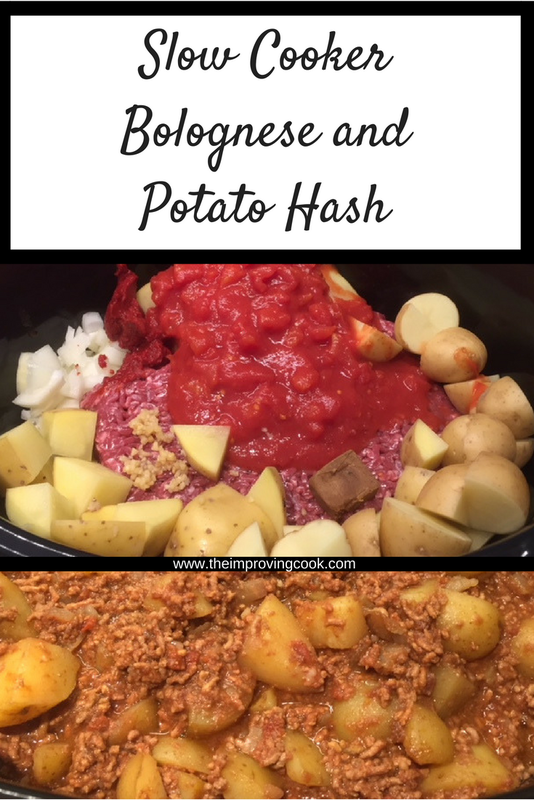 What you get when you make this Slow Cooker Beef Bolognese and Potato Hash, is a big bowl of delicious bolognese with nice chunks of skin-on potato which have cooked in the juices. You can leave the skins on, because slow cooking doesn't cause them to separate like boiling would. Top the whole thing off with some grated cheese, serve with garlic bread and a side salad and you have the perfect bowl of home-cooked deliciousness. Slow Cooker Bolognese and Potato Hash is syn-free on Slimming World Friendly and fairly light on the calorie front at around 370 per portion. 2. Cut the potatoes into small chunks (skin on). 3. Put the mince, potatoes and onion in the slow cooker. 4. Put the tomato puree, tinned tomatoes and garlic on top. 5. Pour over the beef stock and add the Worcestershire sauce. 6. Break up the mince using a wooden spatula. 7. 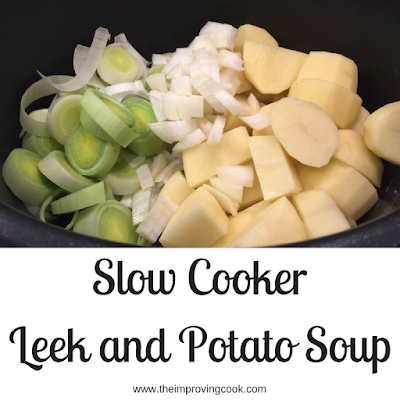 Cook on low for 7-8 hours or on medium for 5-6 hours. 8. Add a little more water if necessary near the end of cooking. 9. Serve with a little grated cheese, garlic bread and a side salad.